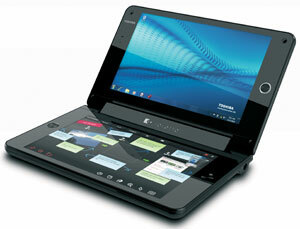 Toshiba announced a dual-touchscreen display notebook concept called the "libretto W100" today. Unlike many concepts which never get in the hands of consumers, Toshiba will be making a limited number of the librettos available in August for "early technology adopters." What makes the Toshiba libretto interesting is its use of two 7" multi-touch screens (each with 1024 x 600 resolution), rather than the combination of screen and keyboard that you find on typical notebooks. The libretto's multi-touch screens can work independently or together, allowing users to browse the Web on one screen while checking e-mail on the other, or view a webpage across both screens. Unlike tablet computers, the divided screen allows you to fold the Libretto in half, making for greater portability and protecting the screen while traveling. 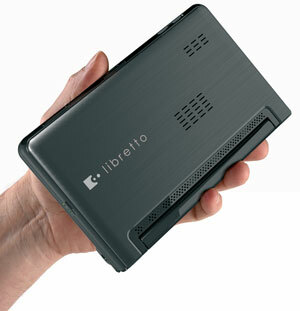 The libretto also has a built-in 3D accelerometer that will rotate the screen into portrait or landscape modes. Because the libretto has two screens, you have to make do with a virtual keyboard. There are six keyboard modes to choose from including simple, full, numeric 10-key and split thumb mode keyboard styles, and the keyboards provide haptic feedback (the keyboard vibrates slightly when you type, similar to many smartphones). I'm generally not a fan of virtual keyboards, but the libretto's worked acceptably. I saw a similar dual-screen concept at CES with the bizarrely capitalized enTourage eDGe. The eDGe was an eInk eReader on one side and ran Google Android on the other. But the eDGe was a bulky, heavy beast. The libretto, on the other hand, is quite svelte, measuring 7.95” (W) x 4.84”(D) x 1.2”(H) and weighing only 1.8 lbs. The libretto runs Windows 7 Home Premium and is powered by Intel Pentium processor, 2GB of RAM and a 62GB solid state drive. Better power than most netbooks, but still anemic compared with most entry level notebooks. Other features include built-in 802.11b/g/n Wi-Fi, Bluetooth®, 1.0 megapixel HD webcam, and an 8-cell battery, which should provide plenty of up-time. Pricing has not been announced, but we were told that pricing would be equivalent to mainstream notebooks (probably in the $700-1000 range). That ain't cheap, so the "early technology adopters" should have deep pockets, as well. There is a market for devices with more ‘screen estate’ than a phone but smaller than most netbooks, and i think this could be successful with the right price and performance.